Paul Walters, Northern Agriservices Regional branch manager, with Josh Crow, United Wholesalers and Growers Farm Manager. An innovative three-piece box by Queensland-based corrugated packaging manufacturer Oji Fibre Solutions is helping Bundaberg tomato producers achieve best price at market and setting new industry standards. 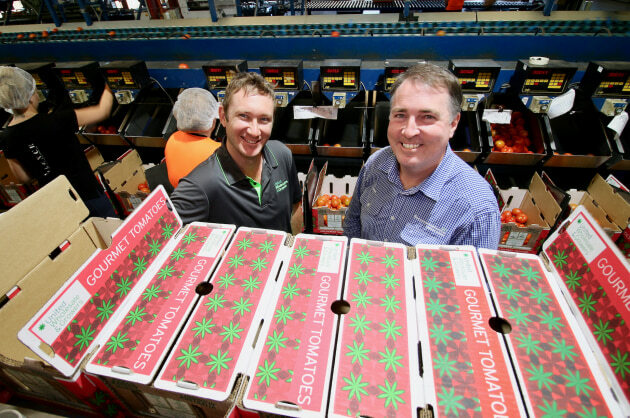 Oji Fibre Solutions’ new Yatala plant has developed a tomato box ensuring grade A tomatoes from Queensland’s Wide Bay area reach Victoria as if they were just picked. The box, created in collaboration with Bundaberg primary producers and Northern AgriServices, looks set to become an industry standard. This is the view of Daniel Scavo, co-general manager of Melbourne based Young Sang and Co, who says the box is a breakthrough as it solves the most critical issue for producers: damage during transport to market. The independent operators have been running farm operations around Australia since 1995 and Scavo said there had never before been a solution to this problem. “OjiFS has upped the level of design in the market and it is going to bring change,” Scavo said, noting that the two piece boxes used by most producers allow for too much movement so when the goods arrive in Sydney or Melbourne – or direct to retail – they aren’t presentable. “It was very difficult and time consuming to re- stack those pallets,” he said. The box is made using Oji's new patented Kraft cardboard technology, and the three-piece design allows customers to use different board grades at the ends of the body. “The weight is in the ends: it transfers from the ends of the boxes to the corner, so if needed OjiFS can make those ends a different board grade to really stiffen it up to make it travel better,” explains Scavo. Northern AgriServices Regional branch manager Paul Walters said factors like moisture, humidity and box strength could compromise an entire pallet of tomatoes with buyers like Coles and Woolworths quick to reject an entire pallet if they could see one or two crushed cartons at the bottom. “They will not go through and sort the good from the bad, that is not their job,” Walters said. “They will just reject the pallet: and that is a straight loss to the grower. 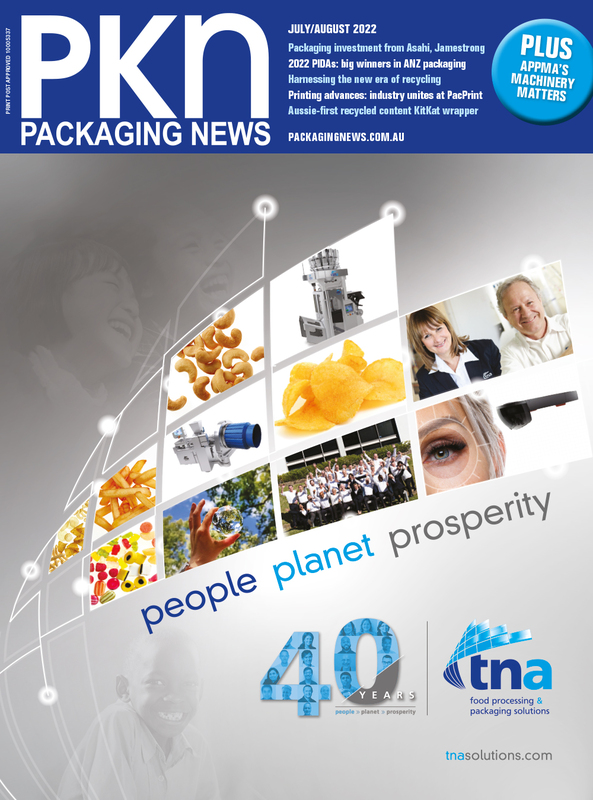 “There can be a lot of frustration with packaging and issues with quality. Our main aim is to get that produce onto Woolworths or Coles’ floor with zero loss. Scavo said the difference his team has observed has been “dramatic” . “Oji cartons stacks straight and interlock brilliantly. They are strong and sturdy: we don’t see any warping – even if there is a bit of rain or they get a bit of water on them: they don’t degrade as rapidly as other cartons. I don’t see other box manufacturers being able to compete. “We have also found the OjiFS colour print is perhaps 50% better than we are used to seeing printed on a carton. We have professionally- designed branding and employ another business to print our boxes so I thought they were the best looking boxes at the market. Until we moved to OjiFS and you had the boxes side by side; the brightness in colour, the clarity of design and the way they present straight up – it was like chalk and cheese. “Moisture issues with tomatoes can also affect the box. There can be residual water If they are washed before they’re packed, then they can be in and out of cold rooms along with the fact the Burnett region gets high humidity and if they are packed in high humidity it can affect the box quality as the cardboard absorbs moisture. “Oji’s Kraft cardboard doesn’t absorb moisture so it actually works a lot better with a high moisture situation.